The first 100 guests staying on Jan 15, 2019 or later will receive an Otabian original design face towel as a souvenir of opening 3 year anniversary ! 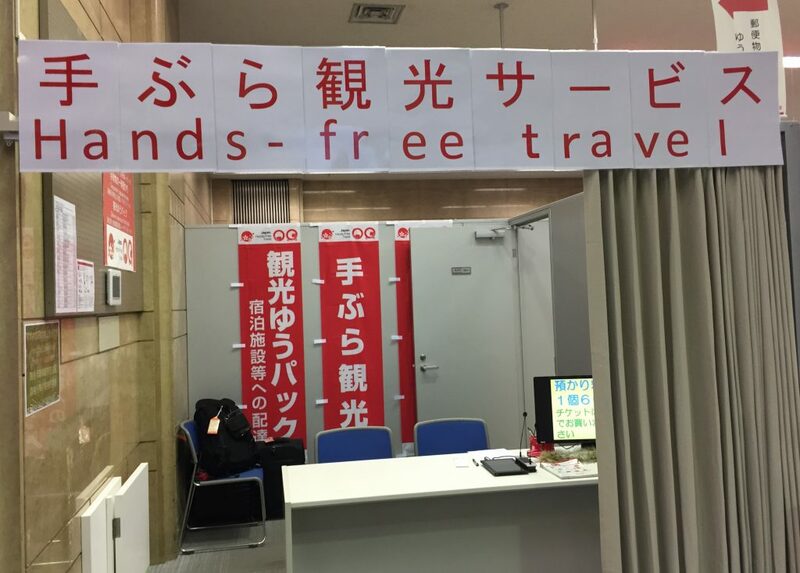 We would like to introduce baggage storage services at Kyoto Station. 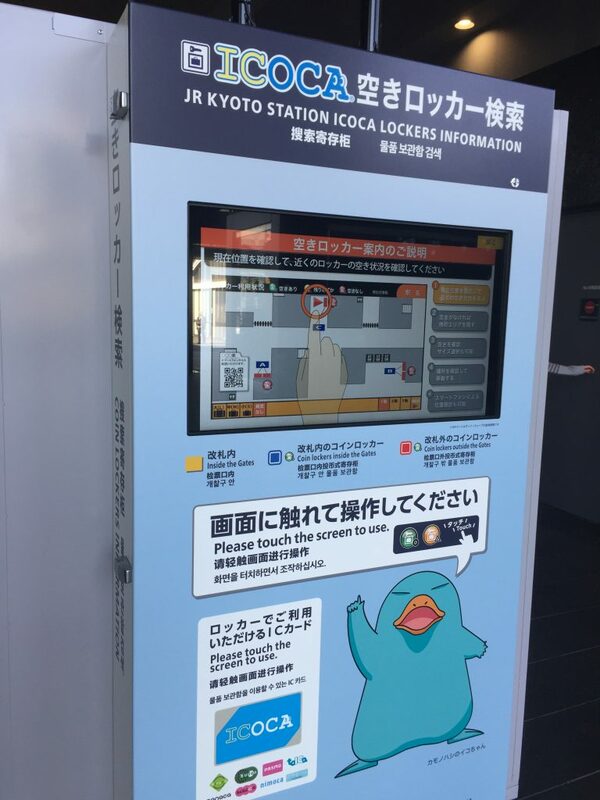 There are around 1000 coin-operated lockers at Hachijo Exit of Kyoto Station, but you may find difficulty in finding a vacant locker specially in sightseeing season of Kyoto. In such cases, following baggage storage services may help you. 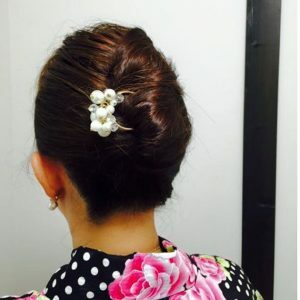 This new service started from April 2018. This service is available only for ICOCA lockers (lockers where payment is made with a transport system IC card). Please note lockers at Hachijo-exit area are NOT corresponding to this service. Touch screen will guide you where vacant coin lockers are. The office of this service is located at Kyoto tower side (North) of Kyoto station, which is opposite side of Hachijo exit (South). Go downstairs using the escalator near the central ticket gate. When you arrive at B1F, find the sign for Underground Central Gate. 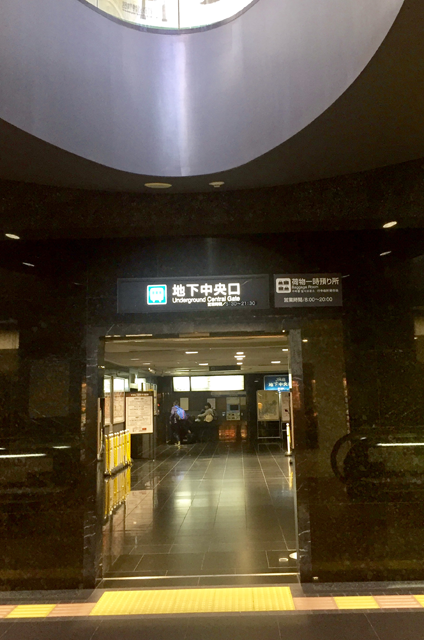 The entrance of Carry Service is just in front of the underground central ticket gate of JR. 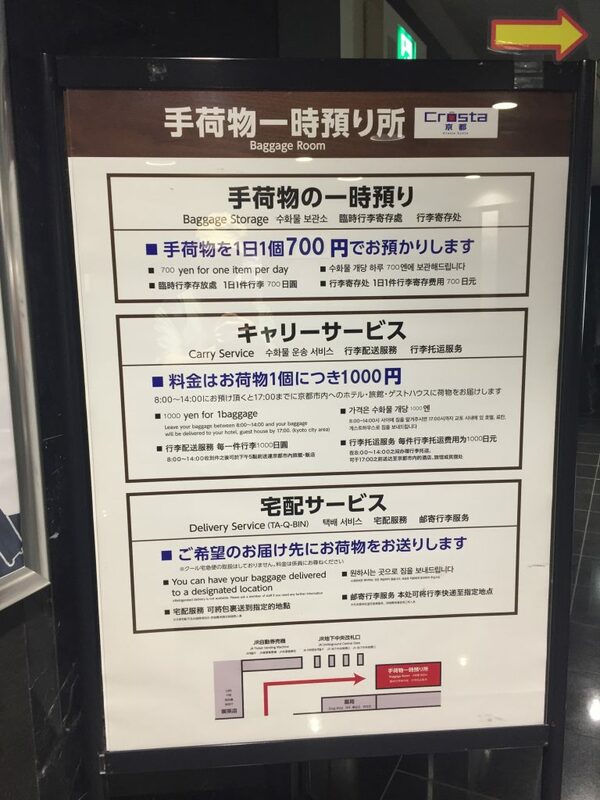 The baggage storage service there costs 700 yen for one item per day. 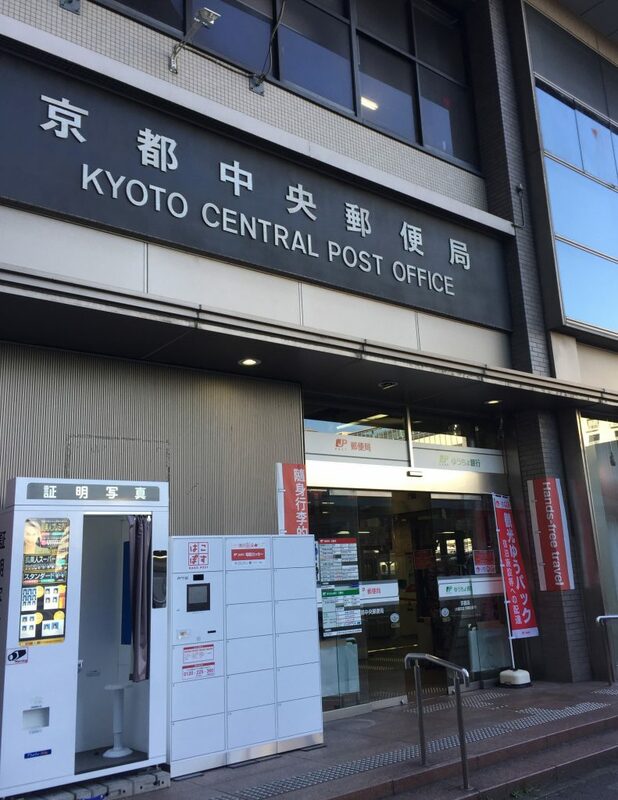 The Central Post Office is located in the west of the bus terminal (Kyoto Tower side). 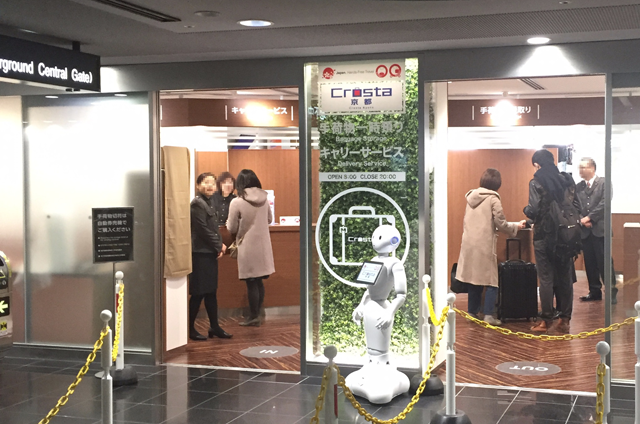 Luggage delivery service by the Central Post Office is also available, but you cannot use it to send luggage to Otabi-an from there. A cloakroom on the third floor of Isetan will keep your baggage until 8:00 PM of the day. 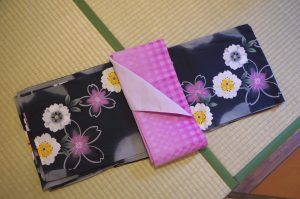 It costs 500 yen for one item, but storage of up to 5 items will be free of charge for purchases at Isetan over 5,000 yen. 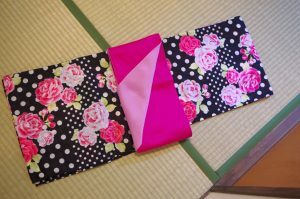 If you plan a shopping in this department store, it will be a good choice. 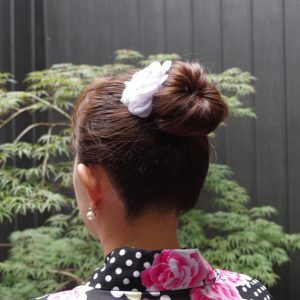 To go to Otabian from the Kyoto Tower side of the Kyoto station, please go upstairs to Pedestrian Walkway, the 2nd floor of the station, then get out from Hachijo West Exit. 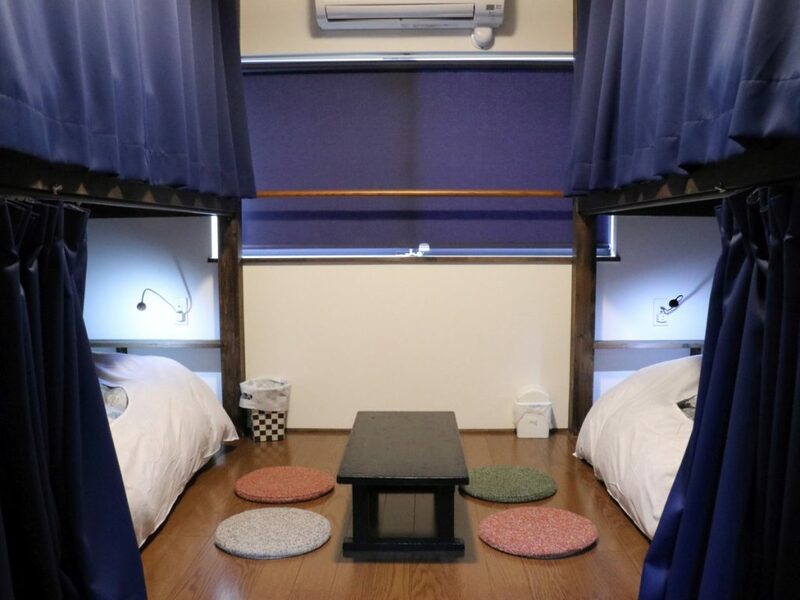 From stays on June 1st, current Men’s dormitory will be changed to a private room for 2 – 4 persons. Please stay with a couple, group or family. For a single use for men, please book Japanese private room. 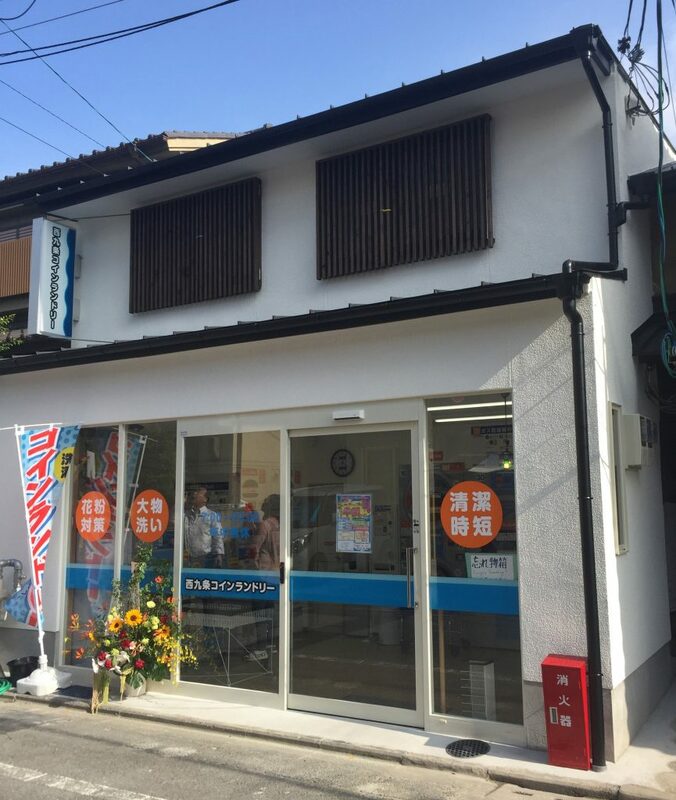 A coin operated laundry is opened at just a three minute-walk distance from Otabi-an. 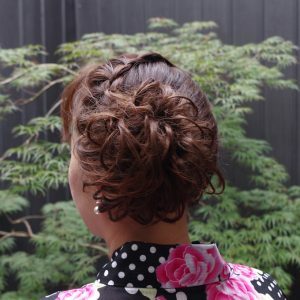 Business hour : 7:00 – 22:00, open through year. See a map shown below. 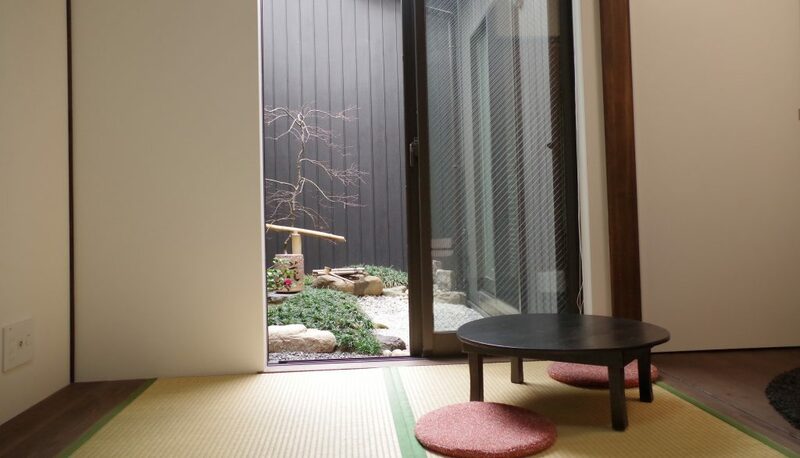 Japanese private room renewal ! 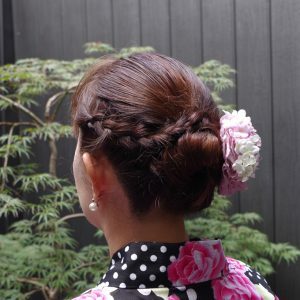 Japanese style private room now accepts up to 2 persons. The room charge for a single use maintains the same. Please book this room at Otabi-an web site. 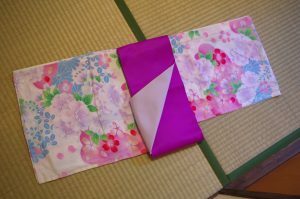 Noren (Japanese store curtain) used in Japanese film “Mother Water” released in 2010, staring Satomi Kobayashi and Kyoko Koizumi is shown. “Yuzu-buro” Yuzuz – Citron – are set afloat in the bath , traditional Japanese custom for the winter solstice. 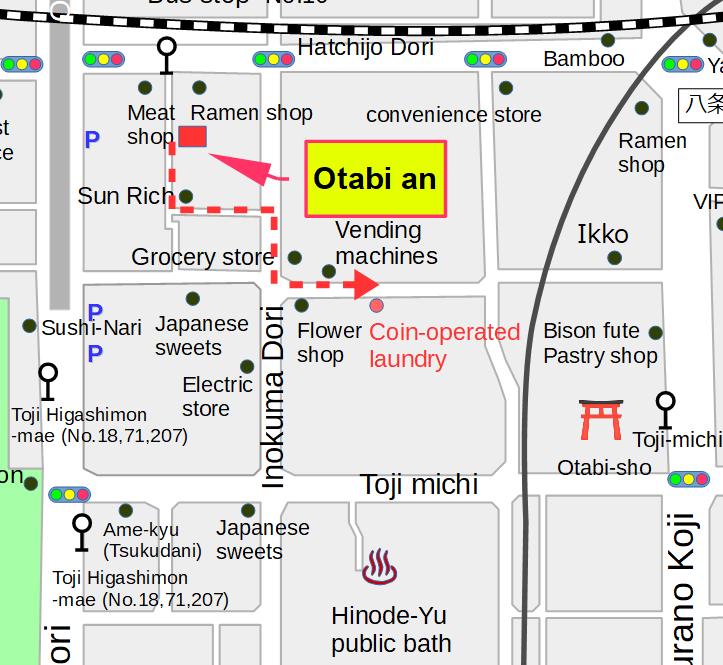 We sell discount ticket for public bath in Otabi-an hostel. 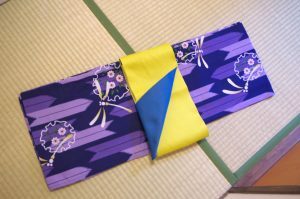 “Hinode-yu” is located at about 400m from our hostel, a distance of 5-minute walk. A guide map is available also. 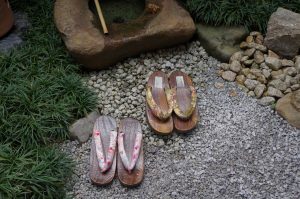 We hope you can enjoy an exotic experiences for “sento” during your stay in our Otabi-an hostel! 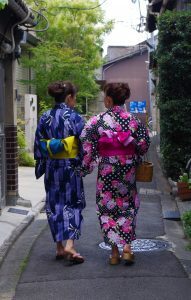 Finished:　Wearing a Japanese summer kimono, stroll along the stree of Kyoto! 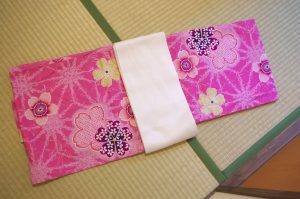 The season for Gion festival has come. 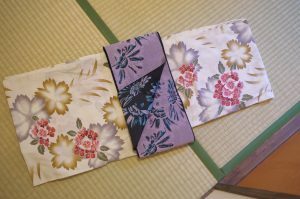 Rather than going to a Kimono rental shop, why don’t you start the day by weaing a Japanese summer kimono in your room during stay in Kyoto Guesthouse Otabi-an and go out to sightsee in a town of Kyoto ? 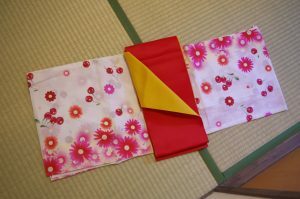 All necessary items such as kimono, obi, bag, hair accessory, Japanese sandals and so on are also available. – Dressing on the day : Please reserve the dressing time between 9:00 and 11:00 am. – Time required for dressing one person : approx. 30 – 40 minutes. 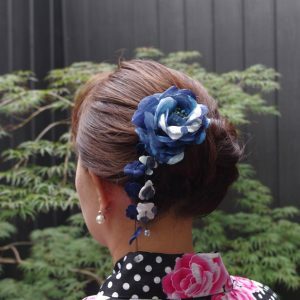 Please choose one from variety of summer kimono and hair set shown below. 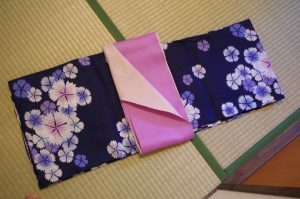 Summer Kimono, half-width obi, inner wear, koshi-himo, face towel for redressment, date-jime, wooden clogs and a bag are included. 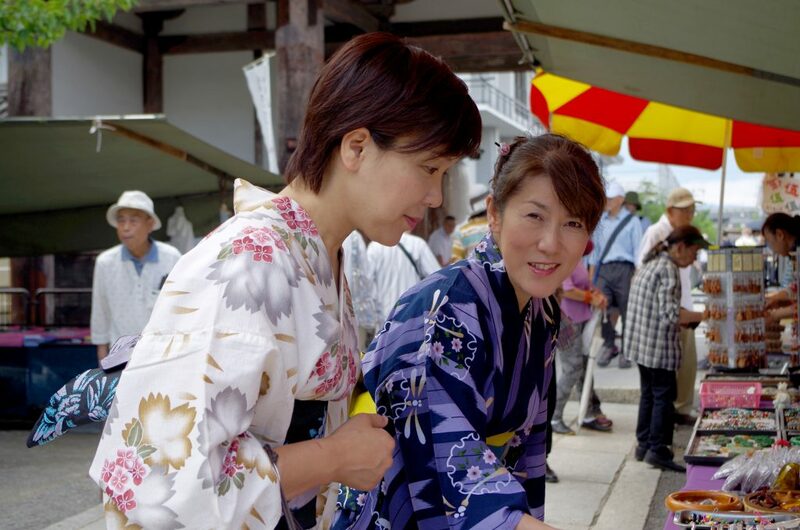 Please emai to info@otabi-an.com for checking availability and reserve a plan, by 18:00 of 3 days before. Please return all rental items by 21:00 of the day. 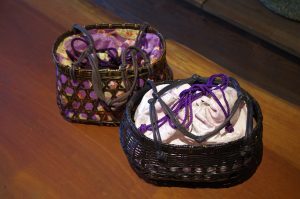 If you stay at Otabi-an at the night, please put all items to a bag for return and leave it in your room or on the bed. 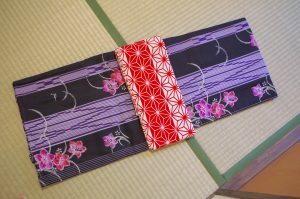 No cancellation charge is required, if the Summer kimono rental is canceled before 18:00 of the previous day.